The navigation and searching of Pink Link Pages Directory is totally free of charge: don´t need register, don´t need login, just access the service and use it. 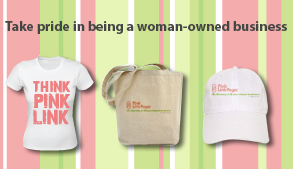 WOMAN-OWNED BUSINESSES ONLY (a woman and /or women having at least 51% business ownership) may purchase annual listings in the Pink Link Pages Directory of Women-Owned Businesses. Both Basic and Featured listings give you complete control of your listing all year long so that you may edit your listing at anytime! A Featured Listing is enhanced with a pale pink background, additional space for a longer company description, the ability to post six photos, a link to your company's website and even space for a youtube hosted video commercial!